Well done and outlines the pitfalls and the things that make this profession incredibly rewarding. "the work of medicine in considerable part rests on the doctor's ability to listen to the stories that patients tell; to make sense of these often chaotic narratives of illness; to inspect and evaluate the listener's personal response to the story told; to understand what these narratives mean at multiple (and sometimes contradictory) levels, and to be moved by them. "An extremely diverse collection. Autobiographical accounts of alcoholism, arguments for the integration of cultural interviews in poverty medicine, and reflections recording the constant struggle against loneliness and the cold stoicism that so often pervades the profession. The anthology pools entries under four headings, describing the qualities required for a successful career in medicine: altruistic, knowledgeable, skillful, dutiful. However, by the end of the first selection, a cheeky piece about a patient forcing her doctor to experience empathy via hypnosis, it's clear these headings cannot (and should not!) be used as a personal checklist for medical aptitude. In day to day encounters, caregivers often find themselves in positions of helplessness where knowledge fails and they must draw upon other strengths to heal their patients. In one, treatise-like entry Eric Cassel points out that emotional pain associated with doubt, confusion, and isolation can be as intense as its physical counterpart. At the end of the day, "the heart must carry the reasoning across those inches or feet of office room" and "the primary role of the good physician is to offer unconditional acceptance of the patient's being; to clarify (without judging) the cause of the illness; to honor the pain, to recognize the fear, and to hold on to hope." It took me a while to read all the way through this anthology, mostly due to its organization. Its section headings are derived from qualities of the physician as identified by AAMC; though this organization makes sense, it ends up creating strange literary combinations within the sections. Long academic essays are sandwiched between heart-wrenching and light hearted stories, and this jarring sequence required me to put the book down at the end of each piece to recalibrate my mind for the next. That being said, the pieces themselves are excellent, plucking at the heart while challenging the mind. These individual expressions create a collective voice to emphasize some of the most pressing and overlooked issues in modern medicine: the need to recognize the whole patient rather than just the disease, the admission of the subjectivity in science and the value in ceaseless exploration and evaluation of the human condition. 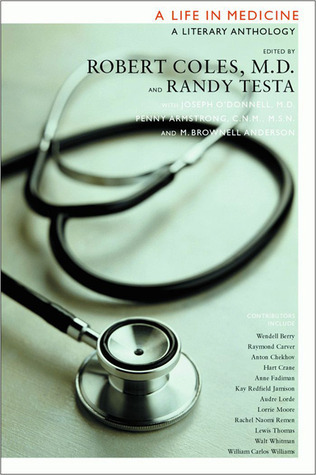 An excellent anthology for physicians. It is a collection of experiences and encounters of doctors with individual patients. Doctors will recognize that they have been similar situations but each patient is unique and it is the uniqueness of the patient as an individual that makes the stories in the anthology fascinating.I would recommend this book to everyone. Anthology designed to expose medical students to issues of compassion, cultural context and the need to balance scientific detachment with decency through poetry, short stories and ethical case studies. This is a wonderful collection. Edited by bone of my former colleagues who epitomized medical humanism. Incredible collection of writing, anyone in the medical profession should read this book. This one will definitely be one that I continuously read for the rest of my life. As a gift from my father and as he did, I still love Medicine. This was one of the texts of my Literature and Medicine course at my university. While I haven't read every single story, the ones I have read were amazing. This is a great anthology! A very good anthology, collecting dozens of stories and anecdotes from doctors and nurses, young and old. A great addition to the medical bookshelf.